The beauty of science is its ability to shape working hypotheses into answers, which may prompt new hypotheses that then could initiate other questions/directions. At the beginning of this study we knew, due to work within our lab as well as within published literature (at the time-- PMID 27066744), that ZIKV readily replicated to high viral loads within the brains of type I interferon knockout (Ifnar-/-) mice, but not within wildtype B6 mice. We wondered how type I interferon responsiveness may be important within a specific component of the blood brain barrier (BBB), that could ultimately lead to the virus restriction from the brain seen within wildtype B6 mice. In order to approach this question we first asked where the Ifnar-/- dependency lied, in bone marrow derived cells or within non-hemapoietic cells? We used the ageless immunology technique of bone marrow chimeras and found that systemic spread required hemapoietic cells, but that efficient virus replication within the brain and associated neuropathogenesis required both. From here, we became interested in determining the cell types in the brain that was important in initiating and/or resulting brain pathology. Image 1: ZIKV (green) infected astrocyte endfeet (red) surrounded endothelial vessel (white). We found astrocyte endfeet, a key component of the BBB, to be highly infected within Ifnar-/- mice and further identified evidence for ZIKV infection to result in vascular leakage. Around the time of this vascular permeability, we saw a large influx of immune cells. The majority of the brain-infiltrates were identified to be effector CD8 T cells. At this point, within the ZIKV field, the main antiviral response to a ZIKV infection had been clearly assigned to CD8 effector T cells (PMID: 28081442, 28330900, and 28330900). Naturally, we then decided to deplete T cell subsets during ZIKV infection and found that upon depletion of CD8 T cells, but not CD4 T cells, resulted in diminished neurological symptoms and significantly extended survival! This was the opposite of what would be expected if effector CD8 T cells had a protective phenotype. We then determined that effector CD8 T cells were causing damage and paralysis through their ability to kill infected neurons. 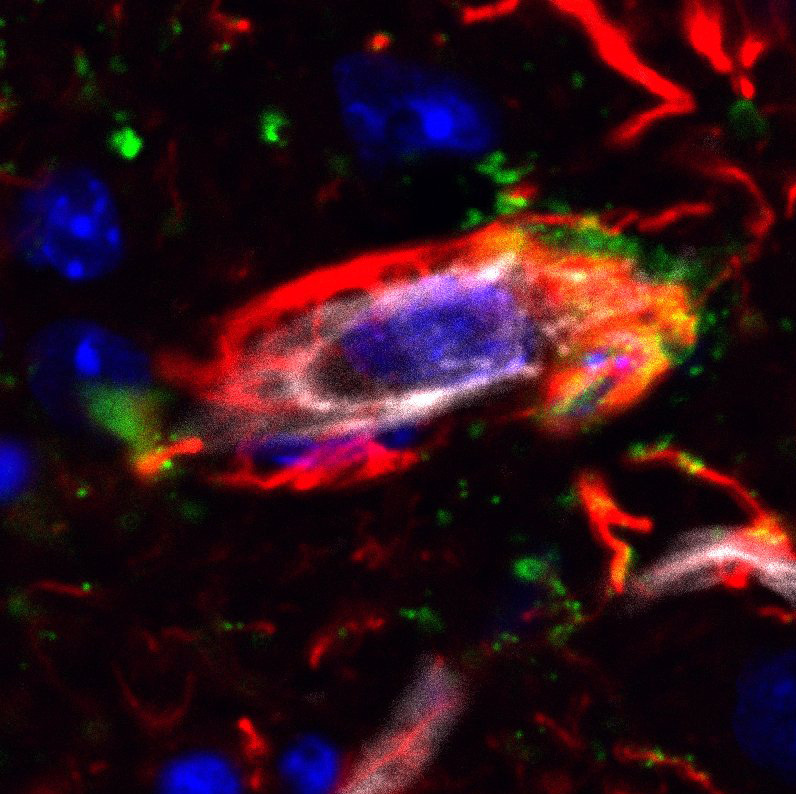 So although we were able to better understand how type I interferon contributed to virus restriction within the wildtype B6 mouse, we found that ultimate neurological disease and death within Ifnar-/- mice was the result of overreactive compensatory response by antiviral T cells in the absence of innate resistance. Even though our approach seems like a Rube Goldberg paradigm, as with his machines, we were able to get to a simple and elegant explanation underlying ZIKV-associated neuropathogensis.